We encourage you to invest in curling today. 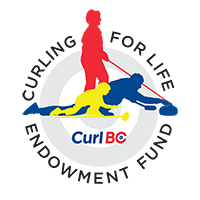 Curl BC has established the Curling for Life Endowment Fund to raise much needed financial support that will help grow and develop curling in this province. Arrange and conduct playdowns and championships in British Columbia for the purpose of determining British Columbian provincial championship teams. Your donation of money, securities, insurance or bequest will ensure future generations of curlers benefit from this shared legacy to local curling, and allow them to enjoy the same rewards that curling has provided to you. To donate online using your Visa or Mastercard, please complete the form below. If you wish to donate by cheque, please make your cheque payable to Vancouver Foundation, referencing Curl BC on the memo line. For questions about this fund or Vancouver Foundation, please contact Claire Vivier at 604-630-5026.